For more than two thousand years, Guang Huan Mi Zong Great Perfection Dharma has been considered as the supreme manifestation of the Nine Vehicles of Buddhism by all venerable masters. It is the essence of all Esoteric Buddhist Dharma, and preserves all the teachings of Supreme Yoga. Master Padmasambhava, an emanation of Buddha, regarded it as the unsurpassed and perfect method of Dharma cultivation. All Dharmas from all Buddhas flow into the Great Perfection. 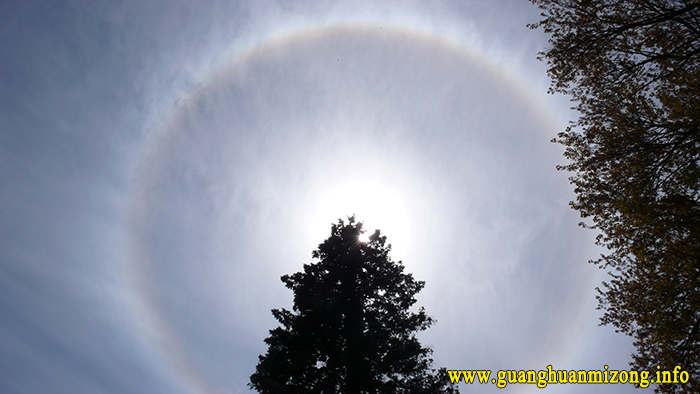 The great World-honored One, Holy Ziguang Shang Shi is compassionate to all sentient beings. In order to enlighten them and relieve their sufferings, the Holy Master manifested in the world to reveal the immeasurable and supreme Guang Huan Mi Zong Great Perfection Dharma, which would only be transmitted individually to destined disciples in the past. In light of the different karmas, different root capacities and different affinities of different people, Holy Ziguang Shang Shi created nine levels of secret cultivation Inner Dharmas out of the Nine Vehicles of Buddhism. If people practice the Dharma in accordance with the right method, their true potential can be activated, their wisdom can be developed to a supreme level, and they will be empowered by the Buddha light and even attain Buddhahood. The unique, simple, and expedient Guang Huan Mi Zong Great Perfection Supreme Dharma, wonderful Cosmic Halo, the unequal healing effects of the dharma, removal of bad karma, the blessings of good fortune, and the mudra and mantra that can develop wisdom, are legendary. They have caused a great sensation wherever the Dharma is preached and deeply impressed all cultivators and destined sentient beings.